Long and lean, its length at least double the width between the ears. Beauty of head is emphasized by delicate chiseling along the muzzle, around and below the eyes, and along the cheeks. Expression soft, yet alert. Eyes somewhat almond shaped, of medium size, placed rather well apart, neither deep set nor bulging. Color, dark to medium brown. Ears set well back and low, not above level of eye. Leather thin, hanging in a neat fold close to the head, and nearly long enough to reach the nose. 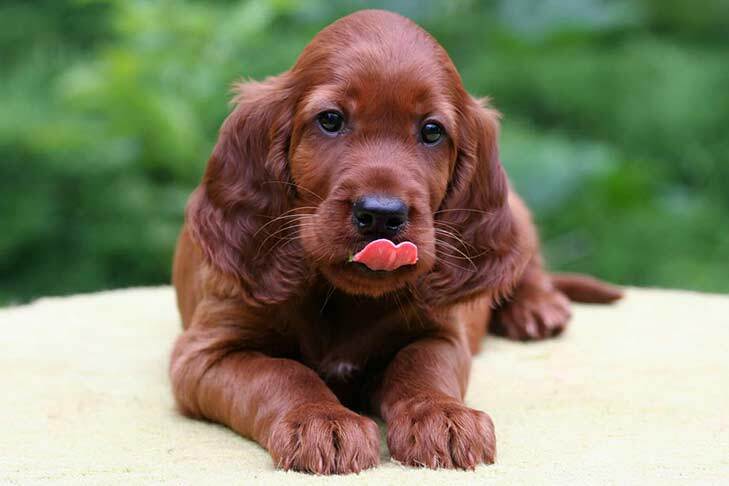 The Irish Setter is a high-spirited gundog known for grace, swiftness, and a flashy red coat. They are famously good family dogs: sweet-tempered companions for the folks, and rollicking playmates and tennis-ball fetchers for the children. The Irish Setter has been described by its partisans as the most beautiful of dog breeds. Standing more than two feet at the shoulder, with a substantial yet elegant build, the Irish is famed for a brilliant coat of mahogany or chestnut. Long, sinewy legs and powerful rear drive help to place the Irish among the swiftest of all sporting dogs. The Irish Setter’s lovable personality has endeared the breed to sportsmen and pet owners for more than 200 years. Irish are outgoing dogs who enjoy making friends. These rambunctious redheads are big kids at heart, but they are eager to please and will respond to patient, positive training. They are said to be bold and rugged hunting partners, with a devil-may-care approach to their work. The Irish Setter should be fed a high-quality dog food appropriate for the dog’s age (puppy, adult, or senior) and activity level. Learn about which human foods are safe for dogs, and which are not. The breed can experience bloat, a sudden and life-threatening swelling of the abdomen, and owners should educate themselves about its symptoms and what to do should bloat occur. The causes of bloat aren’t fully understood, but experts agree that multiple, small meals and preventing vigorous exercise around mealtimes may help reduce the risk of bloating. 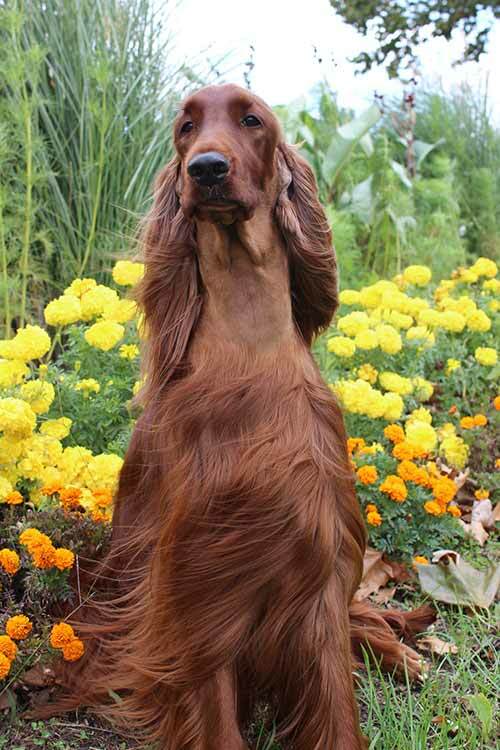 The Irish Setter’s stunning rich-red coat requires moderate grooming to look its best. Irish should be brushed at least twice a week with a pin brush or a soft bristle brush; a long-toothed metal dog comb can also be used to help work out any tangles or mats that may be starting to form. The nails should be trimmed once a month. An occasional bath with a gentle shampoo meant for dogs will help to keep the coat and skin clean and healthy. Grooming sessions are a good time to check the dog all over for any new lumps or skin problems, and to check that the eyes and ears are healthy and trouble free. Like most Sporting breeds, Irish Setters need plenty of daily exercise. This can come in the form of long daily walks and play sessions with their owners—Irish Setters love to be with their people. The breed also exercises mind and body by participating in canine sports such as obedience, tracking, agility, rally, and other activities that can be enjoyed by both dog and owner. The Irish Setter is happy, affectionate, and eager to please. He is full of energy and will appreciate having a job to do. Keep training methods consistent but sessions fun and interesting to be sure he does not become bored. He responds best to positive, reward-based training methods, and not well to heavy-handed or harsh corrections. Early socialization and puppy training classes are recommended. Irish Setters excel in canine sports such as hunting, agility, dock diving, rally, tracking, and flyball, and their sensitive nature makes them a natural as therapy and assistance dogs. 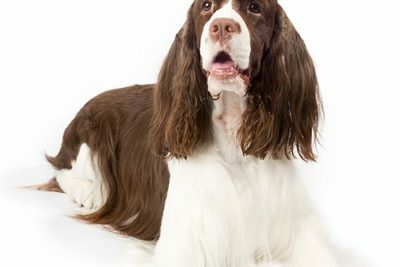 Irish Setters are generally healthy dogs, and responsible breeders screen their breeding stock for health conditions such as hip dysplasia and eye disorders. 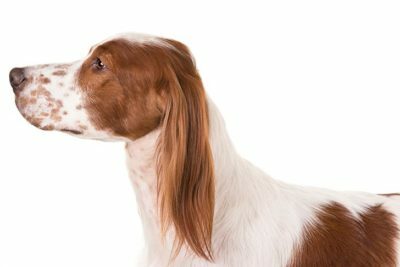 Like other large, deep-chested breeds, Irish Setters can experience bloat, a sudden and life-threatening swelling of the abdomen; owners should educate themselves about its symptoms and what to do should bloat occur. An Irish Setter’s ears should be checked regularly for signs of infection, and the teeth should be brushed often, using a toothpaste formulated for dogs. A setter is a type of dog bred to locate gamebirds by using their keen sense of smell. The setter shows a hunter he’s found birds by “setting” down on his belly. Before the invention of firearms, setters worked in tandem with trained falcons and hunters using nets. Today, setters are gundogs, that is, they work with a hunter toting a rifle. Irish huntsmen of the 1800s bred their sleek, rangy “Red Setters” to move freely and swiftly, the better to cover ground in the wide, flat countryside of the Emerald Isle. 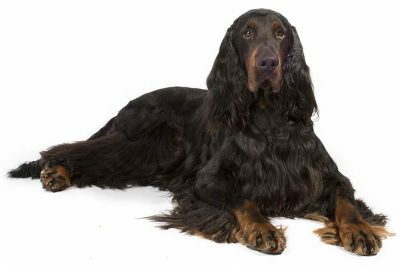 By way of contrast, the Irish Setter’s kinsman from Scotland, the Gordon Setter, was built to flush and retrieve game on rocky, punishing terrain and is therefore a heavier-bodied dog that moves at a more deliberate pace. The Irish Setter earned a reputation as an energetic but efficient worker in the bird fields, and, thanks to its eye-catching good looks and graceful gait, has been a big winner in the show ring since the sport’s beginnings in 1870s. Eleven Irish have won the Sporting Group competition at the Westminster Kennel Club show over the years. The most famous Irish Setter of all time, however, was fictional, the title character of Jim Kjelgaard’s 1945 novel “Big Red.” President Richard Nixon’s Irish Setter, King Timahoe, was named for a small town in Ireland that was the homeland of the president’s ancestors. The Irish Setter is believed to have developed from an English Setter-Spaniel-Pointer-Gordon Setter mix. The earliest ancestors of the Irish Setter were not solid red but red and white. Although the breed possesses no disqualifications, any presence of black in the trademark red coat of the Irish Setter is regarded as absolutely taboo and faulted at shows. Contrary to popular belief, the three setters - English, Gordon, and Irish - are not merely representatives of different colors or varieties within one "setter" heading but are in fact three separate breeds.